The sun was out over the mountains this morning. I woke up to birds and tree frogs and the sun. It was magic. I had a cup of instant coffee (getting used to it – Nescafe does a good job) and stood on my rented patio and just appreciated how lucky I am. In the distance the green-capped peaks were still lightly shrouded in mist, and along the nicely manicured pathways in this living complex the trees are blooming in shades of pink and white. I hesitate to say it was perfect, but it was close. Today I wanted to go to Qingcheng Mountain – home of several protected Taoist temples. Vega and did map searches on our phones (strange wifi for phones but not laptops), and determined the mountain was 13km away. No problem, I thought – what’s (grueling non-metric computations) around 7-8 miles by bicycle? It was fine, truthfully. The bulk of those 13km was flat, through agricultural areas and along well-paved highways. This region is where all the fancy “natural” tables come from – the ones that look like tree trunks, but polished. The last bit, however, the bit that actually went to the mountain, was the promise of what was to come – all incline. Have I mentioned I haven’t exercised since I got here? That I just sit around a lot? I have? That I realized it yesterday? That I told myself not to forget? Well, I forgot. I also forgot basic geography. When I was in elementary school, Mom and I made a geography cake. It had plains (a sheet cake), a plateau (a second cake), some mountains (more cake stacked up), and rivers, each delineated with a different color frosting. Now that I reflect on it, it was the first time I remember my Mom telling me to chill out – the mountains kept falling apart and I was ready to scrap the whole thing, in tears, and she just stuck some toothpicks in the cake for stability and told me the mistakes didn’t matter. First, mountains aren’t perfect. Second, it was cake, and everyone would eat it. Should have remembered the cake. Having spent all day yesterday climbing, I should have reevaluated. But no – I’m a stubborn soul, and I had two days of mountains on my itinerary. I do remember to stretch in the morning, and determine to set an easier pace. I will be mindful today. It is with this mindfulness that I push through the initial inclines to a safe parking place for our bikes, and walk up the slope to the mountain’s entrance. With the sun out, the scenery is gorgeous. It’s like something on a postcard as I ascend – mountains frothing with green, trees blossoming, temples peeking out of bends and heights. It’s all harmonious, which is exactly what I would expect from Taoists. There are shrines to a God of Wealth, a God of Medicine, a God who was a man who did great things and then figured out the Dao of the…clouded dragon?…and then he rode to Heaven on said dragon to be a God. There are dragon turtles holding great slabs of important stone for eternity, and ancient gingko trees stretching up to great heights. There are dragons and yin-yangs on everything, and they mean something! I remember when I was in high school and yin-yangs were trendy things to have on t-shirts and purses. Here they actually represent balance, which I like. Up and up we go. Signs helpfully point out the “negative oxygen ions” I’m breathing in, thanks to the trees. I don’t plan on climbing too high – I’ve topped one mountain, no need to be greedy. My legs are tired. But the stairs lead up, and so I go up. The scenery is so engaging. There are halves of mountains “held up” with dozens of sticks (like toothpicks holding up cake) – mankind doing its part to help the mountain keep doing its thing. Don’t worry, mountain, we’re here to help! 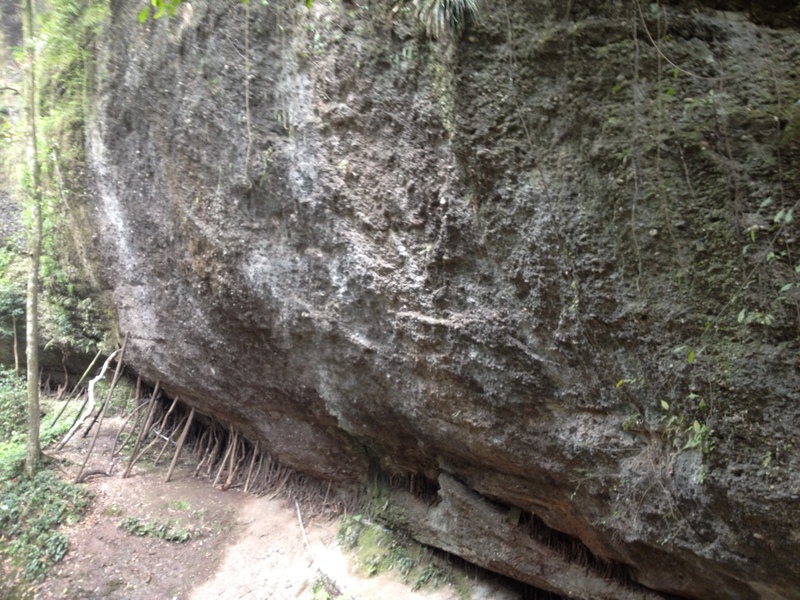 We are supposed to be going to a cave – Tianshi Celestial Cave, near Subjugating Demons Rock and Heart Washing Pool – somewhere near the top of a lower ridge I think – I’m just going up, and I applaud Vega having a climbing goal. We reach Tianshi Palace, a surprisingly large structure on the mountainside, with three or four terraced stories. On terrace two, which has a cool zodiac in stone set around the courtyard (Shrine of an illuminated artifact that protects the local people) we find out the Celestial Cave is closed – no one bothered to say anything the whole way up. I go to terrace three (Hall of the Yellow Emperor), looking up at the higher peaks around me. In the distance I see one of the great temples on the very top – Laojun Pavilion at 1260m. I couldn’t afford the cable car beneath it, which goes the hundreds of feet up. I spent all my money on the entrance fees to the two sites these two days – more than I’ve spent in a whole week. Vega joins me, and he is done. I sympathize. I tell him to wait for me on terrace two, that there’s an awning on terrace four I want to photograph. Really, that’s a front. I feel an inexplicable pull from terrace four. Like if I go up just one more level, there will be something there different, something slightly more amazing. My body is sending warning signals – every step from now will cost me on the way back down. Yet that pull…I guess it’s why I love to travel. It’s not so far, just a few steps more, just another hundred feet up – I understand you now, Pocahontas. You never know what could be there, just a little bit further. Turns out the top of the shrine on terrace four is open to the sheer face of the mountaintop, the peak of which is not that far. And the view – it was a vista worth climbing for. I can see the top of the palace below me, and beyond that the mountains. Let my legs ache. There are things worth a little discomfort. (Later, looking at my strangely framed and uncharacteristically blurry pictures, I realize how tired I actually was). Now for my less romanticized comment: Try as I might, I couldn’t ignore the blatant commercialization of the site. 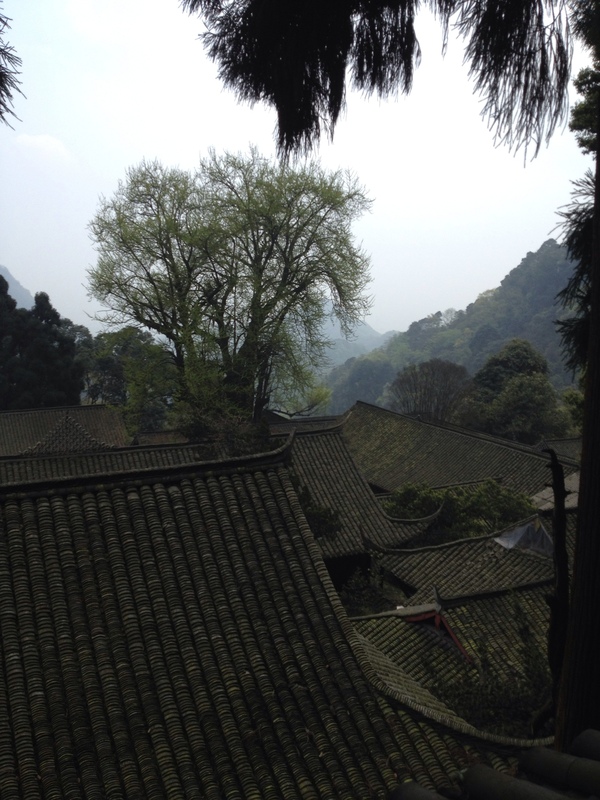 It was like Taoist Disneyland in a way – every height I climbed to I thought there would be fewer people. Nope – every flat space was full of people, all the way up the mountain. There were quiet corners, and I am good at waiting crowds out for the still moments in between. And at every temple, most of the public space had been transformed into vendor stalls, selling cheap plastic toys, fake antiques, soapstone and horn carvings, and concessions. It was…a little depressing. I get that sort of thing at entrances, but three thousand feet up in the mountains I wanted some peace, not another hawker trying to get me to buy a slide whistle. It’s really hard to focus on finding inner tranquility in so much noise. That’s why the hike, though tough, was easier for me today – less noise, surrounded by trees and wild irises, I could let my mind wander. It’s how I climbed an extra few hundred feet today – my guestimate is that we reached about 3000 feet – more than yesterday! The walk down seems easy. A woman is being carried up in a sort of stretcher, and we make way. I ask Vega if she’s sick, and he says no, that she’s paid the two men to carry her up the mountain! What a horrible job, though the men must have adamantium calves by now. We find less used paths with fewer people, and so the descent is quick and smooth. I don’t take genuine notice of my fatigue till just before the base of the mountain – in the last steps I feel tremors in my calves. They’ve done such good work. I promise to take care of them, and my feet. I’m so proud of my legs today. Then I remember the 12 km bike ride. My legs convey the following message to my brain “Wow, you’re proud of us? Really?! Ok, well, screw you! SCREW YOU WE’RE NOT PARTICIPATING IN YOUR STUPID BIKE RIDE!” And my brain responds “Well, are we just going to pout along the side of the road?” My legs don’t have a response, and I hop on the bike and start pedaling. Vega graciously tells me I should take a shower first, since I’m sweating more (gotta teach the teenager about tact before he goes to the States…). I do so, and wash my clothes. I make tea, stretch, and read my trashy fantasy novel. Vega makes dumplings and starts to teach me how to write Chinese characters (top left to bottom right). And now I’m writing, rotating my ankles and testing my knotted shoulders. Tomorrow’s plan? Vega asks hesitantly. Tomorrow I drink tea. All day. This Post was posted in Observations, Places, Reflections, Travel and tagged China, Climbing, Dujiangyan, Geography, Hiking, Qingcheng Mountain, Sightseeing, Taoism, Tourism. Bookmark the permalink.